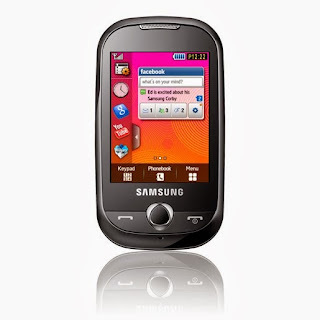 The Samsung Corby, is the first full-touch mobile handset for the youth market that places users at the center of the social media revolution with a wide range of social networks support, such as Facebook, Twitter and MySpace. The new mobile complements the company’s touch screen strategy, “touch for every lifestyle,” by targeting the youth market. It is available in bold color options such as Jamaican Yellow, Cupid Pink, Minimal White, and Festival Orange so that users can choose their favorite colors. Cool colors let you communicate in style. Corby’s changeable, colorful Fashion Jackets let you dress it up and express it all — each and every mood you’re in. Of course you’re always in the mood for fun and its cool Cartoon UI makes using it a blast. But we don’t want you to drop it, that’s why the back of the Corby bends in a wide, sweeping curve that’s as practical as it is fashionable, giving you a firm and easy hold. No matter how you look at it, the Corby really has a grip on style. No matter where in the world you are, you can let your world know exactly what you’re up to. With Corby’s cool Pop-up SNS you get easy access to Facebook, MySpace and Twitter. So you never miss out on your friends’ updates, and more importantly, they never miss out on yours. A convenient news feed keeps you automatically updated on all their latest statuses and comments. Connecting has never been this convenient. Show your loved ones how much fun you’re having on vacation – while you’re on vacation. The Corby mobile phone grants you easy access to your 7 favorite community sites –facebook, myspace, YouTube(TM), flickr, Picasa, friendster and photobucket – so you can instantly upload your wish-you-were-here photos and share every memorable moment. No matter where you are, Corby lets you share your world with the world. Two times the size with just one finger. Sometimes you need to examine things closely and quickly. No problem. Corby gives you the big picture and lets you double the size of. With Corby’s built-in, up-to-date dictionary, you’ll instantly improve your vocabulary – and your spelling skills. A total of eight languages are supported – English, Spanish, Italian, French, German, Portuguese, Russian and Ukrainian – with availability depending on country of residence. But no matter where you go, Corby helps you find meaning. Unlock your phone and access the menu quickly with Smart Unlock, which provides easy added security. You can use Smart Unlock in three ways. Simply unlock. Or, unlock and speed dial. Finally, unlock and run an application. It’s all touch and go with our amazing TouchWiz interface. With its cool vibration feedback you can put your finger on the touch screen and feel the screen touch you right back. Drag your finger across the screen and get a light click. With 27 cool, convenient widgets and 75 more available to download, your favorite features are always at your fingertips. Leave your camera at home – the Corby turns can’t-miss moments into 2MP photos. Digital zoom gets you closer, Panorama Shot takes you wider and Smile Detection captures your subjects at their happiest. You hear it. You want it. But you don’t know it. The Find Music feature records a few seconds of &nbspthe song and sends it to a server that identifies the track, artist, album and genre for you. Stop worrying and start snapping more photos and downloading more music. Corby’s 50MB of memory easily expands to 8GB with a microSD card. Suddenly the Corby is a lot bigger than it looks! A Bluetooth headset lets you carry on conversations wirelessly as well as listen to your music files or the radio without plugging in earphones. It also easily connects to your PC or printer.